The Coalition for Healthy Ports NY NJ is a broad coalition of environmental, labor, faith, community, environmental justice and business organizations that seek to create sustainable ports in New York and New Jersey. We are working to establish model policies that "just say no" to toxic burdens in environmental justice communities faced with the cumulative impacts of pollution and related harm to human health and the environment. 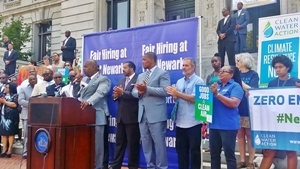 Clean Water is working in collaboration with the NJ Environmental Justice Alliance and Ironbound Community Corporation in the South, West and East Wards of the City of Newark to create a Resiliency Action Plan (RAP). There are times in environmental battles when communities can start to feel this way. However, community organizing can play a critical role in bringing people together to rise up and make a difference. That's why I'm proud to be a community organizer with Clean Water Action. This past weekend, I had an incredible opportunity to work with activists in Staten Island who - like other seaport residents across the nation - are fighting for their health and environmental justice.